Integrating language arts skills into social studies can be tricky. There is already a lot of subject matter to cover without having to teach reading and writing skills as well! If a social studies teacher did not receive much language arts training within his or her certification program, integrating these skills can be even more difficult. However, within the Common Core framework, social studies teachers are expected to integrate reading and writing skills. In addition, it can be difficult to know which skills students need. The good news is many social studies teachers already use some of the most important reading skills. Adding reading to your social studies lessons may not be as difficult as it may seem. 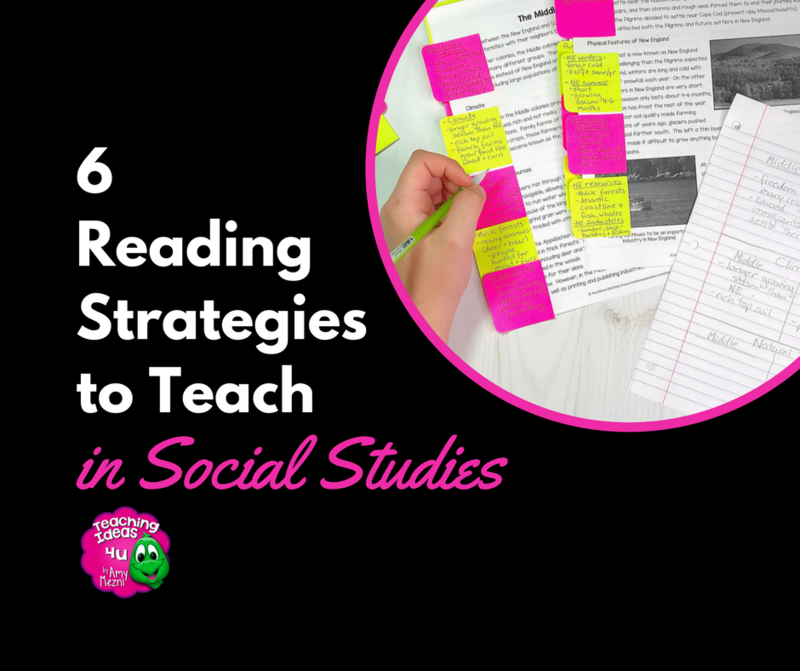 In this post, I am going to discuss six key reading skills that will build literacy within a social studies classroom. For many students, a poor vocabulary really holds them back from a deep understanding of social studies content. Students with processing issues or dyslexia have a difficult time sounding out words or breaking them apart, so reading large chunks of text can be overwhelming. Knowing the vocabulary words before reading can make the textbook or documents less intimidating. The more teachers can do to make new words memorable, the better. Another strategy is to connect new words to other words or to a mnemonic devices. For example, any time I have a vocab word with a common Greek or Latin root, I take a minute to point out the root, its meaning, and other words in that family. For example, aqueduct can be related to so many other words. Many students have studied Spanish and can see that aqueduct is similar to agua (water). It also looks a lot like aqua – the color of water. An aquarium is a water tank for fish. So an aqueduct probably has something to do with water. Giving students multiple connections to other words will help them retain and recall the new word. An example of a mnemonic device is something like latitude is a ladder. Now, that one never really worked for me – neither does lat is fat – but I have had many students that used it. Personally, I always teach that latitude has an A for Around, while longitude has an O for Over. In addition, vernacularisms are important to understand primary documents. Students need to understand the language of a time period in order to really comprehend the stated and implied meanings in a document. Teachers could identify any words or sayings in a social studies text that might affect student comprehension and preteach their meanings. Being able to determine if information is based on fact or is biased has become even more important in the digital age. Tech-savvy groups are getting better at making emails and websites that really look legitimate! Although propaganda and bias are not new, they have recently been brought to the forefront in many classes. When studying history, students can examine propaganda or analyze documents and drawings for bias. At the same time, students also need to learn how to consume information digitally, including how to tell whether or not the site author has a bias. Social studies teachers could coordinate these lessons with the English department. For example, English teachers could perhaps cover identifying bias, propaganda, and fake news from modern sources, while the social studies teachers could weave it into their historical discussions. As this skill is cross-disciplinary, teachers should make sure they are not unnecessarily duplicating content. GCF LearnFree.org has a some excellent digital lessons available for free, including How to Judge Online Information and Evaluating a Webpage. If you are looking for lesson on Fake News, Angie Kratzer sells a unit on TPT. Over the past few years, close reading has been given a lot of attention in upper elementary grades. In close reading, students are really determining the main idea and key details, as well as reacting to the text. Students are taught that multiple readings are required to truly comprehend the text. Of course, without specific instructions, you and I both know many students will read the text one time and keep on going! Another part of close reading is taking notes in the margins. I know many teachers already do this on copies of documents, so just modeling this to students will help integrate this skill. 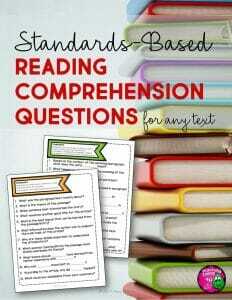 Scholastic – A great overview of the reasoning and steps in close reading. Harvard Writing Center – this article models close reading with a higher level text. Author’s Purpose is especially important in social studies. As students read and analyze historical documents, political cartoons, posters, diaries, etc, they need to determine the author’s purpose in creating the piece. Did the author want to persuade or inform the reader? Is the author simply entertaining or describing something to the reader? Understanding the author’s intent of a piece may affect how the text or image is interpreted. Students should come to middle school with a good understanding of the types of author’s purpose. By sixth grade, this is not a new skill. Social studies teachers may need to do a basic review of the types of author’s purpose, but really, teachers just should try to make a point to ask and explore author’s purpose when examining historical texts or images. We Are Teachers has a good article on teaching Author’s Purpose if you would like more information. Using graphic organizers may help students understand more complex relationships. Some students will start to see the “big picture” of the content with a visual organizer. Teachers can just add a cause and effect graphic organizer to their note-taking system to help students comprehend the cause and effect relationships. Within PowerPoint, there are a few graphic organizers in the SmartArt section. SmartArt can be found on the Insert tab. To find cause and effect, click SmartArt and then Relationships. Once selected, you can add or subtract pieces to fit your needs. Historical perspective has been defined as “attempting to see through the eyes of the people who lived in times and circumstances far removed from our present-day lives.” (Seixas and Morton 2013) As social studies teachers, we need to teach students to understand historical perspective. For many students, this may be a new concept. If you teach upper elementary or middle school, you have probably had students declare a past action to be “wrong” or ‘racist”. This is called presentism, or looking at history from a modern day perspective. From a modern point of view, the beliefs, values, and practices of the past may indeed be considered wrong. However, what students need to ask themselves is how would people of the time period interpret the event? By interpreting events in the context of the time period, students will have a better understanding of how the event, document, etc. would have been interpreted by and affected people. Teachers can introduce students to the time period they are studying with images, quotes, songs, or other cultural artifacts. Using these items as bell ringers can help give students a better understanding of the time period. Discussing the culture and values of a time period will help students form a deeper understanding of the past. The Historical Thinking Project, based on Seixas and Morton’s The Big Six Historical Thinking Concepts, has a good description of historical perspective, as well as teacher resources. Teachers can also find resources on the Digital Chalkboard, created by the California Department of Education. I hope these explanations and tips have been helpful. If you are a social studies trying to integrate reading skills, don’t despair! It seems really overwhelming at first, but there are so many things social studies teachers do that already support reading. Start with one reading skill at a time. Integrate it in a few lessons, and keep doing it until you are comfortable with it. Once that skill becomes a normal part of your routine, add another. 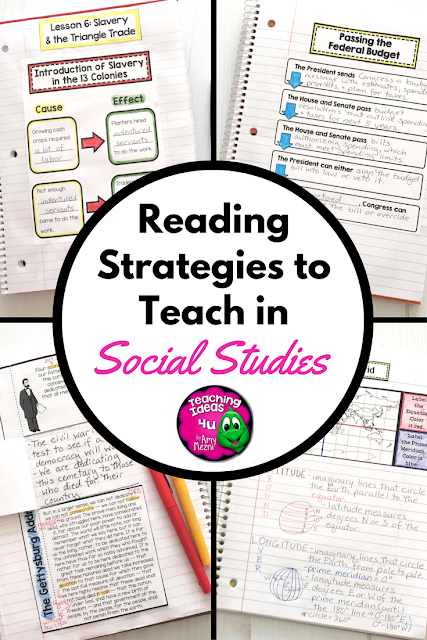 Before you know it, you will be seamlessly integrating reading into your content lessons! Do you have questions? Need help? I would be glad to help! You can reach me by email or just leave a comment.